The 10XGenomics workshop just closed at AGBT and they announced some truly revolutionary new applications: single-cell feature barcoding, single-cell ATAC-Seq and single-cell CNV (feat CBGB). I’ll go through each of these in more detail below but I wanted to start by highlighting the success of single-cell analysis in my own lab (the one I just left for a new job). Update: 10X now have info on their website. We’ve been running single-cell projects for some time and started several years ago with a single-cell CNV project which I presented at the first Festival of Genomics, London. In the last few years we’ve ploughed through lots of Fluidigm C1 chips, which resulted in a wonderful piece of work from Duncan Odoms lab last year describing how aging increases cell-to-cell transcriptional variability, in Science. However the C1 system was slightly derailed by the problems with their chips. About two years ago we bought in the 10X Chromium and our single-cell services have exploded over the last 12 months. We’ve processed almost 400 samples, including a great project on cerebrospinal-fluid; we’re working with a group at Addebrookes who are trying to profile the small numbers of cells in CSF, capturing as many of these as possible, so the high capture efficiency of 10X was a major plus. They are aiming to use this in multiple sclerosis and other inflammatory and non-inflammatory neurological diseases. We’re trying to preserve sample integrity by going from bedside to cell capture and reverse transcription within 1 hour of sample collection, and aim to identify a “disease phenotypes”. 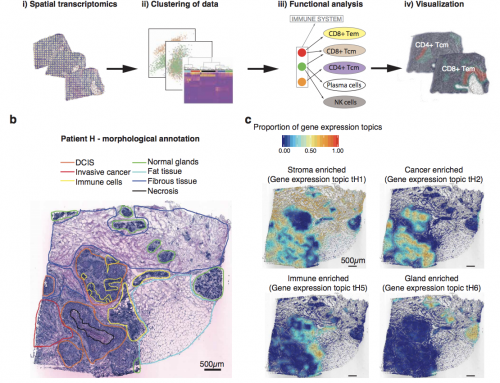 SIngle-cell ‘omics are awesome! 10X described three new products that are scheduled for release in 2018. A large number of 10XGenomics customers have spoken about their desire to see a method for epigenetic profiling of single-cells. Existing methods such as DNase-Seq, FAIRE-Seq or ATAC-Seq probe open chromatin allowing analysis of whether enhancers, promotors or insulators are in open or closed regions of the genome. Most of the published work has been on bulk analysis rather than single-cell, primarily due to the difficulties of getting the methods to work at the nanoscale. Some single cell work has been published (Buenrostro 2015 and Cusanovich 2015) but to date I don’t think there are any commercial methods available. scATAC-Seq methods are important because they allow chromatin state to be linked to cell-to-cell heterogeneity. 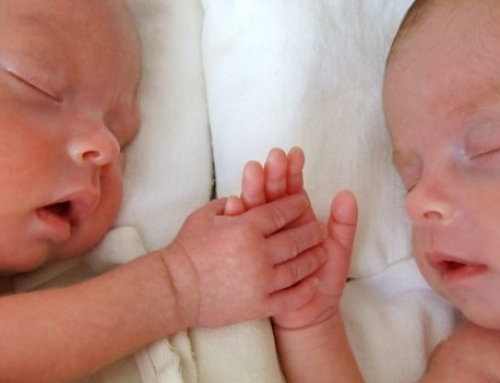 Both the Buenrostro and Cusanovich papers were able to reveal novel biological insights that would have been impossible using bulk methods. However both used methods that are not easy to repeat at scales people are now used to in single-cell experiments i.e. 1000 to 1 million cells! Buenrostro et al used the Fluidigm C1 to perform transposition on individual cells and Cusanovich et al used a plate-based combinatorial indexing strategy. 10X are providing a much easier solution to run on their Chromium platform. The 10XGenomics scATAC-Seq assay captures chromatin accessibility and generates data that are highly comparable to published ATAC-Seq data from bulk samples. The data presented in the workshop show the same characteristic periodicity in insert length distribution due to DNA coming from mono-, di- and tri-nucleosomes, similar genomic coverage profiles, and TSS enrichment data that are also highly concordant with bulk ATAC-Seq. 10X presented scATAC-Seq results from a 1000 PBMC experiment revealing the cell populations in blood. TSNE plots and cell-state data show how easily the scATAC-Seq can be used to reveal variation across cell populations. Data are obviously very sparse at an individual locus in a single cell – it is impossible to answer “is a specific locus open/closed in a single-cell?” – but this is likely to be impossible in any platform given that there are only 2 copies of the genome, and random sampling means many sites that are open will drop out for one or both of these. As such much of the analysis presented relied on collapsing single-cell data into psuedo-bulks based on these states. Single-cell analysis requires an ability to handle the sparse data generated by methods like scATAC-Seq. Previous work by the Greenleaf lab resulted in the chromVAR R package. 10X are likely to be using very similar underlying methods to control for technical biases and allele drop-out. Another method was recently reported as being useable for scATAC-seq analysis. CPT-Seq (Contiguity-Preserving Transposition Sequencing) from Kevin Gunderson and Frank Steemers in the Advanced Research Group at Illumina (I’ve always fancied working there, and I’m sure many readers of they blog would like to too!). In last months Methods in Molecular Biology they describe a comprehensive and detailed protocol for an ultra fast (<3 h library preparation) that they say is cost-effective. How it can be applied to single-cell? You’ll have to buy the £59.99 eBook to find out! 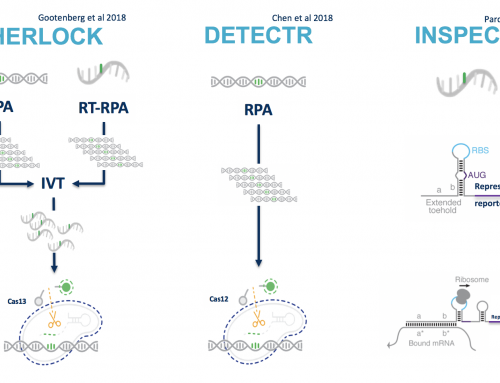 10X presented a product that follows fast on the heels of the wonderful work that came out of the New York Genome Centre* (CITE-Seq) and Merck&Co (REAP-Seq). Both of these methods pair transcript sequencing of individual cells with analysis of their proteins. 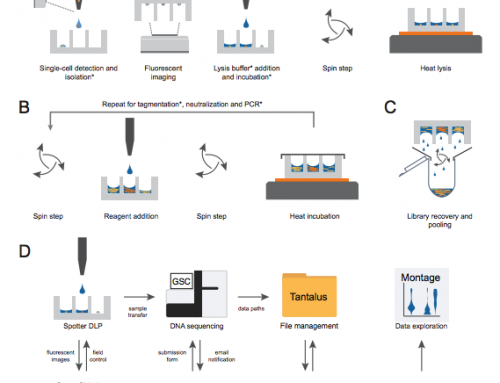 Other methods have been developed to allow analysis of more than “simple” gene expression e.g. Perturb-Seq, for CRISPR screening. All of these aim to generate a much deeper picture of the cell. The feature-barcoding presentation included data from an experiment where naïve T-cells were spiked with EBV antigen responsive cells. These were exposed to the antigen in an MHC tetramer context and data from the 497 cells analysed could detect the antigen specific T-cells and generate full length Alpha and Beta chains. 10X showed this as a POC with a single peptide, but the method can be scaled up to work with 1000s of peptide antigens. 10X have also applied the feature-barcoding method to Peturb-Seq assays. Replicating CITE-Seq, REAP-Seq, Peturb-Seq etc is most likely the tip of the iceberg with respect to what can be done with the method. This product will allow users to innovate on 10X core technology. And this kit is likely to be perfect for a core lab like mine that does not always have the time/resources to work up methods from publications like CITE-Seq & REAP-Seq. *If you’ve not see the BioRxiv Cell “hashing” paper from NYGC do checcki it out – it may be the answer to making 10X 10x cheaper. Available Q4 2018: The 10X feature-barcoding kit is likely to be released early in Q4 2018. 10X are already working with antibody companies to provide pre-conjugated panels. Serge Saxonov (10X CEO) mentioned this briefly at JPMorgan but 10X provided much more in the way of technical details in their AGBT workshop. scCNV is a method I’ve been talking to 10X about for a long time. I had the pleasure of hosting Serge at CRUK-CI about 18 months ago and we’ve kept talking about these methods. I’m really excited that this kit is coming out now and I expect it is going to be a massive hit, especially in cancer studies where CNV can be used to assess tumour heterogeneity. A recent report uploaded on BioRxiv shows how important CNV can be in some cancers. Geoff Macintyre, a senior post-doc working between James Brenton and Florian Markowetz’s groups at CRUK-CI, is the lead author on: Copy-number signatures and mutational processes in ovarian carcinoma. In this report they describe how Ovarian cancer can be molecularly stratified on CNV data generated from shallow WGS (0.1x coverage). However they found that many patients tumours are heterogenous and may contain multiple signatures. Their work was performed on bulk ascites (an almost single-cell suspension in the abdomen), being able to take this biosample and run it on a single-cell platform is likely to more clearly reveal the heterogeneity leading to better treatment options. Data were presented from normal and cancer cell lines. The diploid BJ (Fibroblast male cell line) showed very smooth 2-copy data along all chromosomes. Four cells of the MKN45 cancer cell line show that chromosomal variation is clearly detectable, and that there was heterogeneity within the cell line (something most cancer researchers are, or should be, aware of already). The COLO829 cell line was obviously mosaic and showed four distinct CNV profiles. Interestingly to me this cell line was one used in the development of a CNV algorithm: CNAseg, here at CRUK-CI back in 2010; the lead author was Sergii Ivakhno (who’s been working at Illumina ever since). However that paper made no mention of the mosaicism 10X revealed in their testing. Cell-line authentication has been an issue discussed for a very long time. The Nature journals group recently upped the ante for authors by tightening up on their requirements (see this 2015 editorial). However all cell-line authentication is done on bulk cells and is primarily done with STR profiling. Whilst SNP profiling is coming, maybe now we should be suggesting that the cell archives (ECACC, ATCC, etc) test their cell stocks using the new 10X scCNV kit to verify the level of mosaicism present? If this happens then 10X are assured of a pretty good revenue stream for this product. If I were staying here at CRUK-CI then I’d be suggesting we get on with such a study via ABRF or similar. Compare STR profiles with SNP profiling, and with scCNV as a collaborative project? CBGBs – The method relies on some major methodological developments at 10X and the new acronym to remember is CBGB (think “heebie-jeebies” or “Cbeebies” and you’ll never forget). A CBGB is a Cell-bead – Gel-bead combo. Cells are initially partitioned in a gel matrix that binds the cellular material, but allows reagents to be applied to process different cellular components. The scCNV assay is designed to trap gDNA on the surface of the cell-beads. After cell lysis the nucleus is captured, all the internal nuclear architecture is ripped apart by a combination of proteinase K and alkaline denaturation before a scCNV prep can be performed on the gel-beads. To do this cell-beads are recaptured in droplets along with gel beads. The cell-beads and gel-beads are captured on the Chromium instrument using a super poisson loading which keeps capture efficiency very high (watch the video to see this in actionI’d like to embed it here or link to your website). Think of cell-beads as artificial cells where you can do molecular biology before single-cell prep! The cell-bead removes constraint that all the molecular biology be done in a single droplet, you can now separate multiple reactions all on the same Chromium controller. This is likely to create lots of space for innovation by users. Available mid-2018: The 10X scCNV kit is likely to be released this Summer. 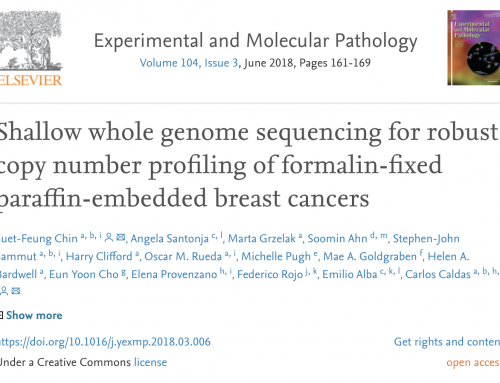 Format is again likely to be similar to the scRNA-seq assay as will sequencing depth recommendations. Software solutions will be available as a module for Cell Ranger. Costs were not disclosed but are lily to be similar to the GX kits so expect $1000 per sample or thereabouts (plus sequencing). PS: The Chromium system is relatively cheap compared to the costs of reagents, especially if you’re going to do a lot of single-cell work. I hope 10X Genomics are thinking ahead to the day they need to change the hardware and considering how they’ll do this without messing up to many labs! PPS: This post was written beforehand based on a conversation with the development team and with embargoed access to the company slide deck. Any mistakes in this presentation may simply be because I’m on holiday in Finland taking a long sauna in -20C rather than sunning myself at Disneyland, Florida with AGBT attendees!